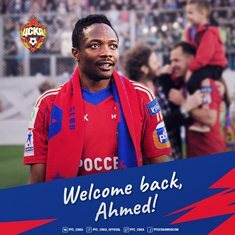 Leicester City loanee Ahmed Musa has insisted that he is ready to play his first game for CSKA Moscow following his return to the club in the January transfer window. The Muscovites will take on Danish outfit Nordsjælland in a friendly on Friday, and the Nigeria international has explained that playing with his new teammates will help him adjust ahead of the club's first competitive fixture of 2018 against Red Star Belgrade a week on Tuesday. ''I will be happy to play if the coach decides to use me. This will allow me even faster to play with the team,'' said Musa to CSKA Moscow's official website. The 25-year-old scored 54 goals in 168 games during his first spell with the capital team.